One of the biggest questions that can occasionally arise after someone is injured in a dog bite attack involves dog bites and liability, identifying which party or parties should be held responsible for damages. In most situations, it’s clear that the dog’s owner’s insurance should be responsible for helping pay out damages that are incurred. We know this because under California Civil Code section 3342 it imposes strict liability to dog owners for any damages suffered by any person as the result of a dog bite, regardless of the dog’s former showing of vicious tendencies or the owner’s knowledge of the dog’s viciousness. However, as briefly described below, there are several other potential parties that may be responsible. “Dog Keeper” or “Caretaker” – What happens if, at the time of the attack, someone else is under the control of the dog? In this case, the caretaker or keeper can also be liable, but not under strict liability. Different from an owner though, prior to an attack or bite a caretaker or keeper must have knowledge of the dog’s vicious propensities in order to be held responsible. Unlike statutory strict liability, in the above situation is based on a “common law,” similar to the “one-free-bite” rule. Moreover, a caretaker or keeper may also be liable for a dog bite if they are negligent in controlling or handling the dog. Residential Property Owners – To establish liability on the residential property owner you must show actual knowledge of the presence of a vicious dog. However, if a dog escapes from the property due to defects in property (i.e. a “hole-in-a-fence”), then the landlord could be held responsible for off-property injuries caused by the dog in an attack. Have the right to remove the dog from the premises. Commercial Property Owners – In the case of commercial properties, the landlord has a stringent duty to inspect the premises in order to discover any dangerous conditions, including a vicious dog (i.e., if a commercial tenant is operating a business on the property and the tenant’s dog bites a customer, the landlord may be liable.) The landlord has a duty to inspect their commercial properties and as a result, cannot avoid responsibility for injuries by claiming that he or she had no knowledge of the dog. Other potential defendants based on the facts – There may be other potential defendants in a dog attack case, such as homeowner associations (HOAs) or child day care centers, depending upon the particular facts of the case. If a dog owner is unable to fully compensate the victim, identifying all of the potentially responsible parties is critical to a successful lawsuit. Hiring an experienced California dog bite lawyer is a key step to investigating the facts surrounding the bite or attack to determining the appropriate parties who may be responsible for the victim’s injuries and increase the odds those injured in a dog bite attack will be fully compensated from all available sources. The California dog bite lawyers at the Dog Bite Law Group have helped many clients deal with the aftermaths of those things regarding dog bites and liability. That includes situations where the landlord was responsible for the damages incurred. We’ve provided some information below to help those who have been injured move forward with identifying their legal rights and options as quickly as possible. When a landlord rents a property to a tenant, that landlord in California has a duty to make sure that the property is reasonably safe for its intended use. That means that he or she must remove or properly warn about any dangerous conditions on the property. Cases in California have held that a landlord was liable for dog bite attacks when problems such as holes in fences on the property were not repaired and a tenant’s dog bit and injured a person. California jury instructions help clarify this issue, and cases such as Stone v. Center Trust Retail Properties, Inc. (2008) 163 Cal. App. 4th 608, have held that landlords were liable for damages in these situations. It’s even possible for a landlord to be found liable for a dog bite attack when the tenant’s dog injures someone off of the rental property. If the dog in question escapes through a dangerous condition that the landlord should have replaced and bites someone somewhere else, that landlord can still be liable. Another situation in which a landlord could be liable for injuries suffered in a dog bite attack involves those when a landlord rents a commercial property to a tenant and either knew or constructively knew that the tenant’s dog was vicious and could have removed the dog but did not do so. This is because it’s reasonable to expect that people will be entering that commercial property during business hours, thereby creating a duty to remove that danger. This duty for commercial properties exists throughout the duration of the rental agreement. Landlords of residential properties can also be found liable for dog bite attack injuries in this regard, but the circumstances are narrower. As mentioned above, the residential landlord has the duty to inspect the rental property at the beginning and at the end of the rental agreement. When is comes to dog bites and liability, the residential landlord does not have the right to inspect the premises during the rental term. As such, the landlord, in this instance, would only be liable for a dog bite attack if the vicious dog was present when the tenant moved in. In legal terms, the residential landlord must possess “actual” knowledge of the viciousness of the dog, where the commercial landlord only needs “constructive” knowledge. The landlord is taking care of the dog while the tenant is out of town. The landlord is walking the dog for the tenant. The landlord allows the tenant’s dog to spend its days in the rental office. The landlord allows the dog to be kept in a common area while the tenant is away. Basically, if the landlord is in control of the dog in any way at the time a dog bite attack occurs, that landlord could be responsible for injuries inflicted by that dog. This reality extends beyond landlords. For instance, if a friend is walking someone’s dog and that dog attacks someone on that walk, the friend could be liable for damages. As can be seen, dog bites and liability for a landlord in California is possible, but attaching that liability requires quite a bit of fact-gathering and legal analysis. People who do not possess a legal background and who suddenly find themselves dealing with painful injuries and financial losses need to focus on their physical and emotional recoveries. Adding the legal process to the situation only adds stress, which can complicate things even more. If you or someone you love has been injured in an attack, you need to make sure that you obtain sound legal advice before deciding how you should proceed. 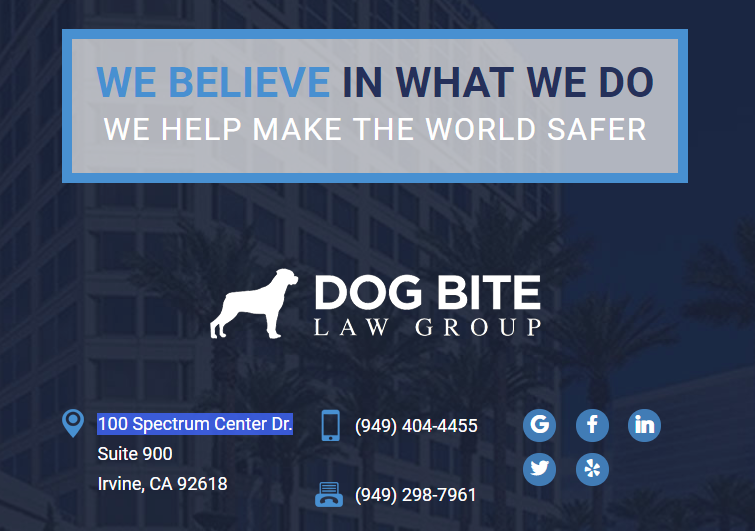 Contact our Irvine Dog Bite attorney at the Dog Bite Law Group as soon as possible to schedule a free initial consultation.